New, Used or refurbished ? Outright purchase or lease rental ? Maintenance agreement or Time & Materials ? Digital Office Solutions offer photocopier, copiers from the following manufacturers Canon, Ricoh, Muratec, OKI and Samsung, recommending the most suitable product for your requirements. Our sales personnel have over 20 years field service experience. Having repaired machines on-site in virtually every scenario, we are able to recommend a photocopier solution most suited to your requirement. As the customer you have a choice, we will always quote an outright purchase price on the initial enquiry, but you can opt to rent the equipment over a three year period with an ownership option at the end. You can opt to rent the equipment over a three year period with an ownership option at the end. How you choose to purchase the machine does not affect your maintenance options, you can have a cost per copy agreement or choose to pay for time & materials. Should you choose the time & materials option you have to understand that the lease rental remains in force for 3 years whether the machine is working or not. Maintenance, do I need it? Not at all we maintain any equipment on a time and materials basis (this not affect your warranty) at a cost £15.00 call out plus £35.00 per half hour. You can opt for a cost per copy maintenance agreement. Colour is 2.9p per print. We sell, supply, install and maintain the following manufacturers photocopiers, copiers :- Brother, Canon, Konica Minolta, Kyocera, Kyocera Mita, Lexmark, Minolta, Mita, Muratec, Nashua, Nashuatec, Oce, OKI, Olivetti, Panasonic, Rex-Rotary, Ricoh, Samsung, Sharp, Toshiba, Xerox. Before you decide on a new copier, take few minutes to read about our refurbished machines. A current model straight from the cardboard box. A discontinued machine that has sat in a warehouse for 2 years. Buying new has potentially less risks than either refurbished or used. A current model that may have produced 3-4 months work. A discontinued machine that has had very light use for up to 2 years. The machine will have more than 160% toner in all 4 colours, (this may be 10% black, 60% cyan, 50% magenta & 60% yellow) if it does n’t we will supply a spare toner cartridge FOC. A refurbished product from Digital Office Solutions is a machine that we have rebuilt from the ground up, replacing any worn or modified parts. Fitted new consumables ie drums, transfer belts and fuser units. Sold with a years warranty. A discontinued or obsolete model. Usually sold due to requiring a lot of new parts. The machine will usually require a consumable to be fitted so purchaser is unable to see the print quality or know whether it works. No maintenance agreement without refurbishing the machine. Hidden costs (a fuser unit for a Ricoh MP C4000 Part No B2232042 can cost as much as £930.00 + vat and fitting). 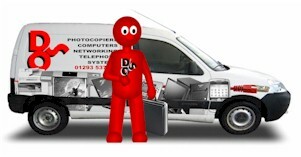 Remember a copier is like a car, new or second-hand it’s only as reliable as the last person to service it!